Hampshire coach Giles White is confident the county can pull off a second County Championship "great escape" in as many seasons. Hampshire, who are eight points adrift of seventh place, know a win in their final match at home to Durham should ensure their Division One survival. "We were in this position last year and things worked out well for us," White told BBC Radio Solent. "Ideally, we wouldn't be here again, but we're a win away from staying up." Hampshire, who have won just two games in Division One all season, will also have their eyes on the match between fellow strugglers Warwickshire and Lancashire at Edgbaston. The Bears and the Red Rose are seventh and sixth respectively with Lancashire 14 points ahead of Hampshire. The highest number of points Hampshire can get is 172, therefore Lancashire need 11 points to secure their safety, and Warwickshire need 17 - but they are playing each other. If Warwickshire lose, a Hampshire victory would keep them up - irrespective of the number of points. 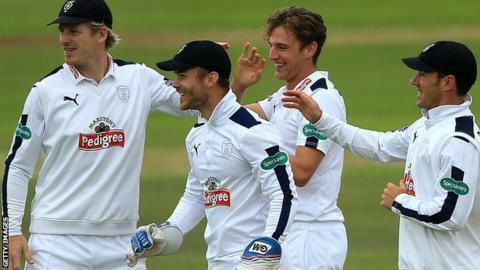 If Lancashire and Warwickshire draw and each take a maximum of 13 points, Hampshire would need to win with at least 21 points to relegate Warwickshire. If Hampshire draw and take a maximum of 13 points, they would not be able to catch Lancashire and could only stay up if Warwickshire take five points or fewer from their game. If they do not take 13, the number needed by Warwickshire would come down accordingly. Hampshire will be encouraged by the fact they escaped relegation last season with a win at Nottinghamshire when they were 16 points behind Sussex. "It's the same thing at the end of the day," White added. "We've got to win. "If we win, we're unlikely to go down and that's the challenge ahead of us. Let's hope the weather doesn't play its part and we get four full days to put in a performance." Who will become county champions?